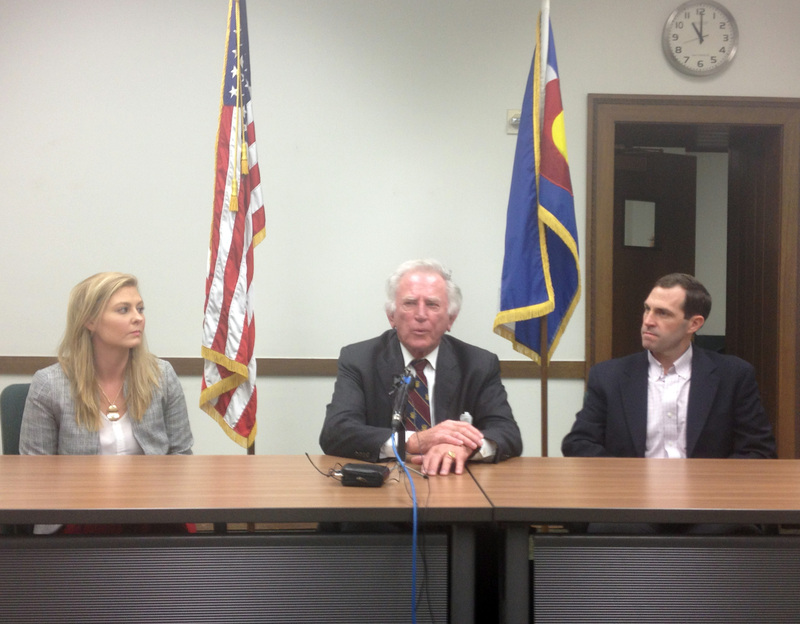 Gary Hart Comes Out Clearly For Agreement With Iran; He Hints Michael Bennet Will Too..
Danielle Glover (left) and Captain Crowe (right) of the Truman Project , with Gary Hart in the center in the John Denver Room at the Colorado State Capitol. I ran into Gary Hart in the halls of the State Legislature. It turns out we were both trying to locate the room where he was to give a press conference on the Iranian Nuclear Deal and were having difficulty finding it. We exchanged a few words, and after asking a maintenance man working wiring in the hall, found our way. I don’t know how old he is, near 80 maybe? Whatever, he still cuts a handsome figure, thin, impeccably dressed, a fine head of hair although it is all gray. As with many of us growing older, he seems to be somewhat hard of hearing…but what the body might lack, the intellect makes up for. He was very sharp and clear in his comments. He know his stuff about the agreement, came out four square for the agreement that would limit Iran’s nuclear energy program in exchange for an end to sanctions against that country and the freeing up of sequestered Iranian funds in U.S. and European banks. He fielded essentially everything thrown at him in the question and answers, calmly and systematically. The press, with its usual gutter level understanding of the agreement, seemed obsessed with two issues: first the verification questions. They seemed to have swallowed – and then regurgitated – the same old stuff coming out of the country’s right wing, AIPAC and the like. They were also curious as to how Michael Bennet might vote on the issue. Hart thought Bennet would probably make a public statement very soon, in a day or so. Some one in the audience suggested that Diana De Gette, the Congresswoman representing Denver would also shortly announce. The press conference was organized by the Truman Project, a group of post 9-11 U.S. military veterans of the Iraq and Afghanistan Wars, who support the agreement. Although only Hart’s remarks are transcribed here, Capt. Crowe, a veteran of Iran and Afghanistan, also came out openly in favor of Congress supporting it too. This press conference appears to be a part of a national “push back” campaign orchestrated by the White House and Liberal Democratic supporters of the agreement to counter the rightwing and AIPAC hysteria media campaign that has characterized the opposition to the agreements. It appears that they have waited until the last moment to press those Senators and Representatives sitting on the fence, to come out in support of it. While Gary Hart was supporting the agreement in Denver, across the nation, in New York City, U.S. Ambassador to the United Nations, Samatha Powers, in an article in Politico, was arguing essentially along the same lines as Hart was. On the same day as Gary Hart endorsed the agreement, U.S. Secretary of State John Kerry laid out the administration’s case in Philadelphia, essentially hitting on the same points as Hart and Powers. What follows is an unofficial transcript of Hart’s remarks and his responses to several questions. On several occasions Gary Hart mentions former U.S. Senator Tim Wirth as also supporting the agreement. Most of the questions that followed centered around verification issues and how Senator Michael Bennet might vote on the issue. In an additional note, a participant at the meeting related how at a District Six meeting of Denver Democrats, that U.S. Representative Diana DeGette had taken a straw poll of the 40 or so participants, every last one of which supports the agreement. Although there might be a sentence or two missing – the transcript is essentially accurate. “Earlier this week former Senator Gary Hart joined dozens of former members of Congress urging current members to support this deal. This is nothing new, Senator Hart has long been a leader when it comes to the challenges and opportunities that America faces. His service to his country and his commitment to keeping America safe and articulating a clear and well defined role for America in the world continues to this day. I am very glad to be here. I have served for a number of years on the advisory board of the project (the Truman Defense Project) and I am very pleased that you’ve all come out and that I can join Ms Glover and others at the Project as well as Captain Crow from whom you will hear shortly. I think some facts need to be stated about this agreement. Many of us object including Senator Wirth (former U.S. Senator Tim Wirth – D – Colorado) to calling it “a deal.” It is a joint comprehensive plan of action involving seven countries. This is not a bilateral treaty negotiation between the United States and Iran even though that impression has been given by the media and politicians in Washington. This negotiation was sanctioned by the United Nations and particularly by the Security Council of the U.N. It involves not just Security Council members but also the German Republic and of course the government of Iran. The agreement that was completed last month, in the middle of last month, has been endorsed unanimously by the U.N. Security Council and by all but one of the 193 member nations of the United Nations. What is being discussed – sometimes well and some times not well – in Congress, in and around Congress, isn’t whether to destroy to agreement, it’s whether the United States should withdraw from the agreement. There is every indication that even if, under pressure from Congress, our government withdrew from this agreement that the other signatories of the agreement would continue to obey its terms. That includes in exchange for lifting of sanctions and liberation of funds sequestered in various Western European and American banks that there would continue to be some enforcement of nuclear restrictions on the Iranian government. We just simply would not be part of it. There is no indication given by any of the other signatory nations that, if the United States chooses, under pressure from Congress, to withdraw from the agreement that other nations would do likewise. So the net effect, if Congress were to prevent the President from lifting sanctions and liberating sequestered funds would be that our country, the United States, would forfeit international leadership. We would be the one ostracized and the rest of the democratic world would go forward in normalizing relations with Iran and doing everything they can to prevent from getting a nuclear weapon or producing nuclear materials in the next 12 to 15 years. The sole standard by which this agreement should be judged by the American people, including the people of Colorado, is whether it makes us safer or less secure. It is a very difficult argument to make that we would be more secure without this agreement and with an Iran that is free to go forward without restrictions in developing a nuclear arsenal. It is not in our interest for that happen nor is in the interest for our European or Middle Eastern allies for that to happen. So it is our hope that members of both the Senate and the House – but particularly the Senate – and there have been, as you know, a number of Senators announcing in recent days support for this agreement…it is our hope that if there is a negative vote on this agreement in the Senate and the President vetoes it, that there will be sufficient votes in the Senate not to override that veto. Even better is if there are sufficient votes in the Senate to prevent a negative vote or a vote that the President will have to override. Before we take your questions let me make one or two other comments as a veteran of arms control negotiations starting way back in the Seventies. We don’t negotiate with our friends. I don’t think we have an arms control agreement with Great Britain or any of our Western allies. We negotiate with our adversaries as an alternative to military action. And with the advent of nuclear weapons in the 1950s, we first obviously, followed by closely by the Soviet Union, – the world got to be a much more dangerous place, and that is what we are trying to prevent – another nuclear power joining that dangerous world. What we discovered in terms of the Cold War [in our relations with] the Soviet Union was the way to prevent that from happening – and when we began in serious negotiations with them in the Fifties and Sixties – those nuclear arsenals on both sides were growing exponentially for no reason other than – in the language of the time – “to make the rubble bounce” if World War III started again. So we learned under Republicans and Democratic Presidents that negotiations with our former adversary, the Soviet Union, was the best way to cap both of those nuclear arsenals and then begin the systematic reduction of them. And we have learned based on that Cold War experience that the best way to prevent other nuclear arsenals from being created is through negotiations. That’s what Secretary Kerry, added by Secretary Moniz of the Energy Department, a nuclear physicist, were able to do within these negotiations and with the full support of our allies including, it must be said, Russia and China. In response to a question about contacts with Senator Bennet: Have you had any discussions with Senator Bennet about this? Gary Hart: I have indeed. We’ve been in pretty close contact recently. Two or three weeks ago, former Senator (Tim) Wirth and I had a long discussion with Senator Bennet and laid out our experience and I, particularly given my lengthy experience in nuclear negotiations with the former Soviet Union and urged Senator Bennet to “make the right decision”..and I think he will. My guess is that one resource that he has used, and that is a very aggressive man called David Kay. About a year ago Secretary Kerry appointed me to chair the International Security Advisory Board of the State Department. David Kay is a member of that board. If you recall the name, David was the lead inspector in Iraq prior to the Iraq War and has a career background in verification of treaties and discovery of arsenals of weapons of mass destruction, not just nuclear but chemical and biological weapons. Senator Bennet has been in discussions with Mr. Kay on the issue of verification and I recommend to you an article that David wrote in a publication called the National Interest as to how and why this agreement with Iran is totally verifiable. Secretary Moniz said yesterday I a speech the 150 page agreement does not contain the word trust anywhere. This is not based on trust. In response to a question on verification in Hart’s discussion with Bennet.